The beautiful sunny weather almost always allows for practising water sports without wetsuits or with short and thin wetsuits. The average temperatures in summer are really high, which allows for walking around in shorts 24 hours a day. The sun tans very quickly here, so don’t forget proper protection. A great fun for those who only want to walk around in the water – depending on the tides, they reach 200-400 metres away from the shore. This enables safe fun on various types of swimming equipment. When running courses particularly for children, they can be fully carried out in shallow water. And if someone feels like swimming further, it’s not a problem either – the area further from the shore is already really deep, although the perfectly clear water creates an impression that the bottom is very close. Omiš offers thermal winds that blow very regularly. Throughout the majority of the summer season, the weather is very stable, which allows for setting the watch virtually on the basis of the wind. In the morning blows the bora wind – less stable, but often very strong, with flat water. From 11 AM, the direction changes and the perfectly stable mistral starts to blow parallel to the shore, which allows for planing at the peak around 1-4 PM. Most of the time, the water is very flat, which enables polishing of skills. 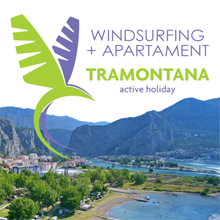 However, if temperature changes occur, we can sail in Omiš in the wind – jugo or tramontane. Both these directions are characterised by a virtual lack of squalls and low waves. 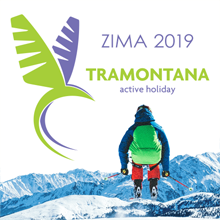 Seeing as each, even the most passionate sportsman sometimes takes a rest, a great place for this purpose will be the sandy beach, where the Tramontana base is located. We use only the very best – at the Tramontana base, we have new equipment manufactured by the Italian RRD company. There will be no problem with water-soaked boards or sunburned sails full of holes. Everything is brand-new so that nothing would hinder your joy of sailing. Sizes of sails at the disposal of Tramontana begin with small ones, with the total surface area of 1 square metre (ideal for small children), and end with more impressive ones, with the total surface area of 7.5. The size increases every 0.5 metre. The boards we have start at the volume of 105 litres, and end with as much as 220 litres. Such equipment will enable comfortable learning both for a 5-year-old and for an adult, for a beginner and for an advanced surfer. Apart from the basic windsurfing equipment, our assortment also includes waist harnesses, short wetsuits – everything tailored for children and adults. For very picky persons, we can procure almost every board from the RRD’s assortment.